The aims of this study were to evaluate the physical and chemical change of pummelo fruit during storage with waxing and wrapping, and to determine the effect of waxing and wrapping and their its interaction in affecting shelf life of pummelo fruits. This research was arranged in a randomized complete block design with two factors and three replications. The first factor was waxing consisted of without waxing, 10% beeswax, 5% beeswax, and chitosan. The second factor was wrapping consisted of without wrapping and wrapping using either transparent yellow or white plastic wrap. Pummelo fruits experience weight loss, reduced total soluble solid (TSS), decrease in firmness and total acidity during 48 days of storage in room temperature. Waxing using beeswax or wrapping using plastic wraps significantly suppressed weight loss and maintained fruit firmness compared to those without waxing and wrapping. However, waxing and wrapping did not significantly affect the quality of pummelo fruits. Based on the fruit’s weight loss, firmness, and panelist preferences, 5% or 10% bees wax can be used as waxing. Both transparent yellow and white plastic wraps can be used to maintain fruit weight, firmness, and appearances during storage. Abdel-Kader, M., El-Mougy, N., and Lashin, S. (2011). Evaluation of grapefruit coating with chemical preservatives as control measure against postharvest decay. Pytopathologia 59, 25-38. AOAC. (1995). “Official Methods of Analysis of AOAC International, 16th Edition”. 1141 pp. Washington DC, USA. Boonyakiat, D., Seehanam, P., and Rattanapanone, N. (2012). Effect of fruit size and coating material on quality of tangerine fruit cv. Sai Nam Phueng. Chiang Mai University Journal of Natural Sciences 11, 213-230. Chien, P.J., Sheu, F., and Lin, H.R. (2007). Coating citrus (Murcott tangor) fruit with low molecular weight chitosan increases postharvest quality and shelf life. Food Chemistry 100, 1160-1164. Cohen, E., Lurie, S., Shapiro, B. Ben-Yehoshua, S. Shalom, Y., and Rosenberger, I. (1990). Prolonged storage of lemons using individual seal-packaging. Journal of the American Society for Horticultural Science 115, 251-255. D’Aquino, S., Piga, A. Agabbio, M., and McCollum, T.G. (1998). Film wrapping delays ageing of ‘Minneola’ tangelos under shelf-life conditions. Postharvest Biology and Technology 14, 107–116. D’Aquino, S., Molinu, M.G. Piga, A., and Agabbio, M. (2001). Influence of film wrapping on quality maintenance of “Salustiana” oranges under shelf-life condition. Italian Journal of Food Science 1, 87-100. Hassan, Z.H., Lesmayati, S. Qomariah, R., and Hasbianto, A. (2014). Effects of wax coating applications and storage temperatures on the quality of tangerine citrus (Citrus reticulata) var. Siam Banjar. International Food Research Journal 21, 641-648. Lange, D.L. (2000). New film technologies for horticultural products. Horticulture Technology 10, 487-490. Machado, F.L.C., Costa, J.M.C., and Batista, E.N. (2012). Application of carnauba-based wax maintains postharvest quality of “Ortanique” tangor. Ciência e Tecnologia de Alimentos 32, 261-268. Oyedepo, T.A. (2012). Effect of Citrus maxima (Merr.) fruit juice in alloxan-induced diabetic wistar rats. Science Journal of Medicine and Clinical Trials 2012, 1-6. Pascall, M.A., and Lin, S.J. (2013). The application of edible polymeric films and coatings in the food industry. Journal of Food Processing and Technology 4, 1-2. Pavlath, A.E., and Orts, W. (2009). “Edible Films and Coatings: Why, What, And How?”. 1-23 pp. Springer. Piga, A., D’Aquino, S., Agabbio, M., and Piergiovanni, L. (1997). Polyethylene film packaging affects quality of ‘Lisbon” lemons during long-term storage. Italian Journal of Food Science 1, 25-35. Rab, A., Haq, S., Khalil, S.A., and Ali, S.G. (2010). Fruit quality and senescene related changes in sweet orange cultivar blood red uni-packed in different packing materials. Sarhad Journal of Agriculture 26, 221-227. Rahayu, A. (2012). Karakterisasi dan Evaluasi Aksesi Pamelo (Citrus maxima (Burm.) Merr.) Berbiji dan Tidak Berbiji Asli Indonesia. Thesis. Institut Pertanian Bogor. Indonesia. Rodov, V., Agar, T., Peretz, J., Nafussi, B., Kim, J.J., and Ben-Yehoshua, S. (2000). 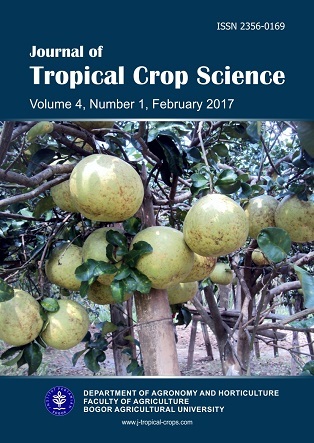 Effect of combined application of heat treatments and plastic packaging on keeping quality of ‟Oroblanco‟ fruit (Citrus grandis L. x C. paradisi Macf.). Postharvest Biology and Technology 20, 287-294. Rusmono, M. (1999). Pengembangan Model Simulasi Penyimpanan Buah Terolah Minimal Berpelapis Edibel dalam Kemasan Atmosfir Termodifikasi. Thesis. Institut Pertanian Bogor. Indonesia. Shahid, M.N., and Abbasi, N.A. (2011). Effect of bee wax coatings on physiological changes in fruits of sweet orange cv. “Blood Red”. Sarhad Journal of Agriculture 27, 385-394. Siahaan, O.S.B. (1998). Pengaruh Pelapisan Lilin Terhadap Daya Simpan Buah Jeruk Besar (Citrus grandis L. Osbeck) cv. Nambangan pada Dua Kondisi Suhu yang Berbeda. Thesis. Institut Pertanian Bogor. Indonesia. Sonkar, R.K., and Ladaniya, M.S. (1999). Individual film wrapping of Nagpur mandarin (Citrus reticulata Blanco) with heat-shrinkable and stretch-cling films for refrigerated storage. Journal of Food Science and Technology 36, 273-276. Susanto, S. (2004). Changes in fruit quality of pummelo experiencing storage and remaining on the tree. Journal Hayati 11, 25-28. Susanto, S., Ginting, M.R., Tyas, K.N., and Rahayu, A. (2010). Change of fruit quality of 11 pummelo cultivars during storage. In “Re-Orientation Research for Optimize the Production and Horticultural Chain Value”. (I.M.S. Utama, A.D. Susila, R. Poerwanto, N.S. Antara, N.K. Putra and K.B. Susrusa eds. ), pp. 396-401. Indonesian Horti-cultural Association. Tabatabaekoloor, R. (2012). Orange responses to storage conditions and polyethylene wrapped liner. Agricultural Engineering International: CIGR Journal 14, 127-130. Tariq, M.A., Thompson, A.K., Asi, A.A., Virk, N.A., and Javid, M.A. (2004). Curing and seal packaging effect on peel and pulp weight loss in scuffing damaged and undamaged citrus fruit. Journal of Agricultural Research 42, 67-72. Tsai, H.L., Chang,S.K.C., and Chang, S.J. (2007). Antioxidant content and free radical scavenging ability of fresh red pummelo [Citrus grandis (L.) Osbeck] juice and freeze-dried products. Journal of Agricultural and Food Chemistry 55, 2867-2872. Vicente, A.R., Saladie, M., Rose, J.K.C., and Labavitch, J.M. (2007). The linkage between cell wall metabolism and fruit softening: looking to the future. Journal of the Science of Food and Agriculture 87, 1435-1448.